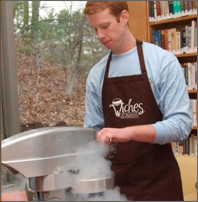 ‘Wiches of Boston, LLC prepares fresh, additive free ice creams right before your eyes with cutting edge liquid nitrogen technology. From ice cream to milk shakes, ‘Wiches of Boston can bring a new level of excitement to your special event by preparing sweet and savory treats in a mist of liquid nitrogen. Serving the greater Boston area and surrounding towns, we will travel to your event and give it that special ‘Wiches of Boston touch. We proudly provide our specially trained LN2 "mixologists" for set up, service, and clean up for all engagements. We start with the purest ingredients: cream, milk and sugar — locally sourced and organic whenever possible. 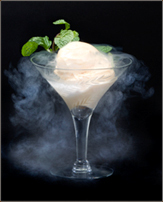 Then we customize it for you with the freshest seasonal flavors and zap it with liquid nitrogen. Our trained “mixologists” then concoct your special liquid nitrogen treat on site and present frozen ice creams as scoops, whoopie pies, cookie sandwiches and our newest item, profiteroles! Look what our customers have said about their ‘Wiches of Boston events! We produce an ever expanding range of custom ice cream flavors, milk shakes, ice cream sandwiches and savory appetizer ice creams. © 2019 'Wiches Of Boston, LLC. All Rights Reserved Worldwide.